My oh my.. so many months since my last post and much too long since my last bag!! Time is just getting away from me.. I was very happy to test a new bag from Emmaline Bags in June. The pattern was released early this month. It's called the Totes Ma Tote. A fun name for a fun bag! The bag has some lovely details.. I love the side accents. I used a cotton canvas for the exterior, with a vinyl for accents. I choose to do the base of the bag in the accent fabric. The vinyl got quite thick and the straps were a bit of a challenge. I had to leave the short ends unfinished and used rivets to secure the straps as I couldn't get through 2 layers of straps. The top has a zipper closure to keep your valuable neice and secure. 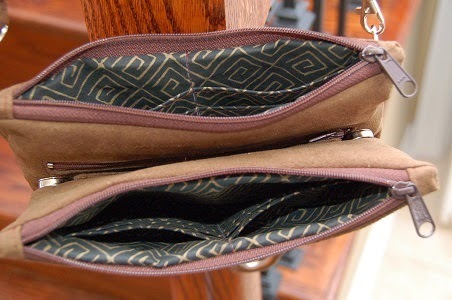 Instead there is a large pocket that is secured with small flap with a magnetic flap. There is also a zipper pocket and slip pockets. I love how the bag turned out! Its a roomy, functional, good looking bag. The hardware and details make it very professional. And if you are looking for the hardware Janelle does sell them in kits or separately in her store. And it's been the year of Emmaline Bags on nissaMade. The 3 bags I've made this year have all been Emmaline Patterns! So YAY for that.. but booo to only making 3 bags.. hope to fit some more in the next half of the year. Wow, it's April. I had blog-less March. And not much sewing. I did however use my Cameo cutting machine for a few wall art projects. First for my son's play room, a series of super hero canvas. My son painted the canvas the background colour. I cut the images out of various colours of vinyl using my silhouette machine. I used transfer paper to apply the vinyl to the canvas. Pretty straight forward. The only slightly complicated part of was the Batman with multiple colours. I had to apply each colour separately so just had to make sure spacing etc was ok.
My other project is something I really love..
Each of the 6 canvas was painted blue or red and the white is vinyl. This was more complicated as I had to break up the map into 12x12 pieces. Applying the vinyl so it everything lined up was a bit tricky but not too difficult at all.. I love the aqua and red colour combo. I've been seeing it in a lot of fabric. This is now up in my new sewing/craft space that I will share sometime soon. Just waiting for my husband to put some finishing touches. I've come across a couple Bag-making events that I thought I would share. First if you own Sara Lawson's Big City Bags book, there is a sew-along for a bag a month from the book. It began in January so this month is the second month with the Go-Go bag . Also the u-handbag blog is hosting a Bag Making Clinic. You submit your bag making questions and next week there will be some answers! You know this will be very infomative as Lisa Lam the person behind the blog has written two bag making books and her blog is full of tons of great information already. I just completed making a Butterfly Sling Bag. The pattern is by Emmaline Bags and part of the Bag of the Month Club. I was very excited when I saw the pattern arrive in my email on Febuary 1st. A very orginal design and well written pattern! 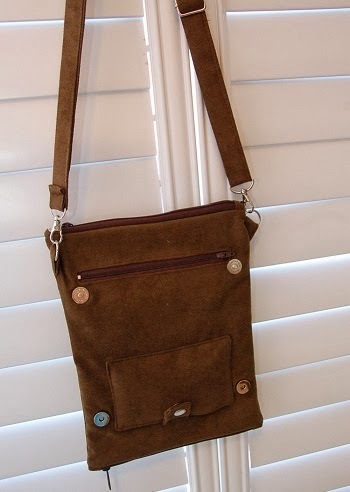 I used a brown suede like fabric I had in my stash. 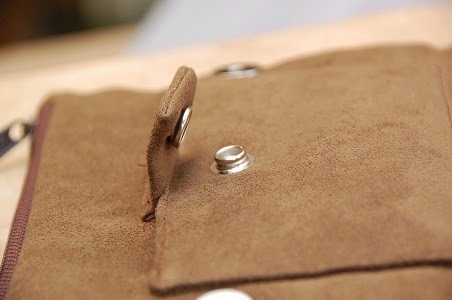 I originally wanted to use a gray faux suede but didn't have matching zippers. The zippers are long pull ones which I think gives them a nice, substantial look and feel. Between the zipper compartments there is a zipper pocket and and slip pocket (which can't be seen in this photo. The pattern is also includes a id window pocket but I didn't have any clear vinyl so forgo that. 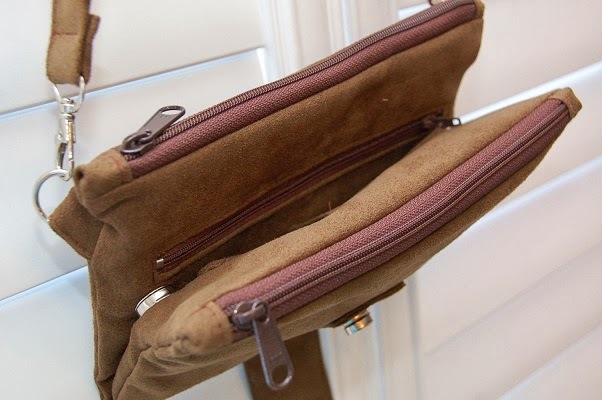 You can flip down the front zipper compartment. The id window would have been right under the zipper pocket. I added a small flap with a heavy duty snap. That pocket would be used for a phone and the flap insures it wouldn't slip out when opened this way. I likely won't need to open it up though, since both the zipper pocket and slip pocket are accessible when the bag is folder together. And can I tell you that I really, really dislike snaps. I have a plier-like tool to install them. I still had to go through 3 attempts and wasted snaps,to get one properly installed on. Inside each zippered compartments is 6 card slots. So lots of built in storage. 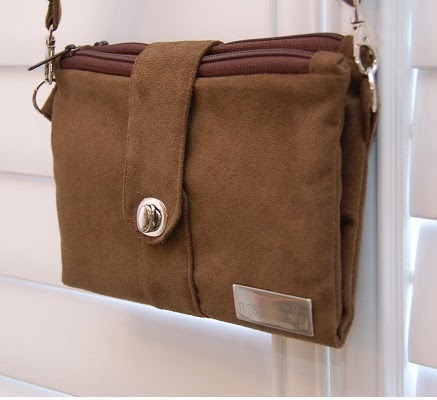 I attached the adjustable strap with swivel hooks as I wanted to be able to switch out the strap for a wristlet strap. It's would be an oversized wristlet but I can see myself throwing it into a bigger bag when traveling and having the wristlet option handy. So there you have it.. my February bag.. I haven't made up the January bag yet. I couldn't find fabric I wanted to use for it in my stash and I'm determined to dwindle down my stash before buying some more. 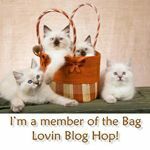 I just came across this blog hop by Elison Lane and had to share as it promises to feature patterns and tutorials for handmade bags .. and we can't get enough of those right!! Anyway, I'm looking forward to seeing the other stops on the hop and maybe even finding some new blogs to follow.. Thought I would do a shout out to one of my favourite blogs, At Home with Mrs H . Samantha is a bag pattern designer and makes some fabulous bags. Samantha just released a FREE bag pattern about a week ago. Looks like a great, versatile bag... and free! Samantha posts the many bags she makes from her own patterns and other designer's. This is one of my favourites!. So browse around, plenty of good reads and photos to enjoy. I'm sure you'll have a chuckle or two with this lovely lady's witty sense of humour! 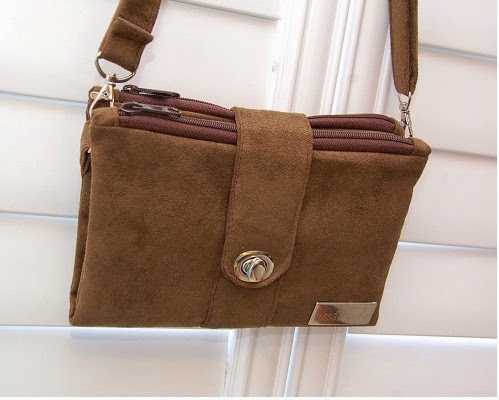 For more bag blogs that I love, check out my "Bag Blog Love" page. I've been neglecting that page but hope to add some more favourites soon. Just wanted to share a little DIY gift I made for a bridal shower gift. My husband pulled the bar of the hanger. I used numerous things from around the house to bend the wire around. The wire was easy to bend but bending it around an object gave a smoother curve. I used pencils, markers, a pestel - really anything I thought had the curve size. I had a bit of trouble with the d and e. I had made the d too small and had to try to fix so that part of the wire is not as smooth as I would have liked. To finish it off, I cut the wedding date on my cameo in some adhesive vinyl and added that. Rookie blogger sharing my bag making addiction with a sprinkle of other sewing and crafty projects. And maybe some other random stuff.